Welcome to the first official issue of The eBullet, an online newsletter of "The Andy Griffith Show" Rerun Watchers Club (TAGSRWC). This first issue of The eBullet will be fairly brief because we want to get some feedback from our subscribers about the content and length. We know that many readers may have somewhat different expectations and needs from an online newsletter than from a paper one. At least initially, we'll include many of the regular features that have been in the printed Bullet, but for things like merchandise updates, we'll provide only brief highlights and then supply links to our Weaver's Department Store site for more extensive details. Because of the different formatting requirements of subscribers' computers, we'll also provide links to photographs rather than including photographs in the actual eBullet, which will necessarily be a "text only" newsletter. Our Weaver's Department Store also has an online newsletter that comes out every couple of months (the plan is for it to be alternate months with The eBullet). It focuses mainly on information about Mayberry merchandise, but also includes important news about Mayberry events and the "The Andy Griffith Show" cast and crew. You can sign up for the Weaver's Newsletter by going to the link given above. TAGSRWC's other main vehicle for Mayberry information is simply our Web site at http://tagsrwc.com/. It has extensive content and links for just about everything a Mayberry fan might be looking for. We hope that through The eBullet, The Pocket, The "Who's Been Messin' Up the Bulletin Board?" Digest, Weaver's Newsletter, tagsrwc.com and our network of nearly 1,200 local chapters that all Mayberry fans can easily find desired information and ways to enhance their enjoyment of watching "The Andy Griffith Show." Now on to this month's news. Check the Event Calendar for a complete rundown by going to the "Event Calendar" link at tagsrwc.com. But coming up in the next week to 10 days are two fantastic events that deserve a special alert. First Betty Lynn and Howard Morris join Don Knotts for a show at the Country Tonite Theater in Pigeon Forge on Monday evening, June 25. Call 1-800-792-4308 for tickets and further info. Later that same week, nine Mayberry stars (Don Knotts, Betty Lynn, Howard Morris, George Lindsey, Bernard Fox, Maggie Peterson Mancuso, and Doug Dillard, Rodney Dillard and Dean Webb from Original Dillards) will be at Opryland in Nashville for four shows from Thurs., June 28, to Sat., June 30. There's a Dinner/Variety Show and Autograph Session on both Thurs. and Saturday and two longer concerts (but no autographings planned) on Friday (at 1 pm and 7 pm). Several combinations of tickets are available for the Opryland event, including some with 2-night hotel packages. Call 1-888-976-2000 for reservations and more information or visit the link to Opryland's site about the event from the Event Calendar at tagsrwc.com. NOTE: The official word from Opryland is that Don Knotts will not be signing autographs during the Autograph sessions on Thurs. and Sat., but the UNofficial word is that he intends to sign if he's feeling energetic enough (we'll try to make sure that he has his Mister Cooky Bar that day!). But Don and Opryland just don't want folks to expect him to autograph and then be disappointed when he doesn't. So officially don't "overexpect," but unofficially, remain hopeful. Oh, and one other summer event to draw your attention to is the Memphis Film Festival, August 1-4 at the Holiday Inn Select Memphis Airport. It's a "Planet of the Apes" them this year, but one interesting Mayberry connection is Sam Edwards, who appeared in four TAGS episodes, most notably as the husband/father in both "Christmas Story" and "Andy Forecloses." Visit http://www.memphisfilmfestival.com/ for more information. And of course, don't forget about the 12th Annual Mayberry Days in Mount Airy, N.C., September 27-29. Festival favorites Maggie Peterson Mancuso, Doug Dillard and George Spence are TAGS cast members who are expected to be on hand. Another special guest star or two is possible. We'll have an update in the August eBullet. Meanwhile, visit http://www.surryarts.org/ for more information. The following chapters have started since our report in the last issue of the printed Bullet. We're getting close to our 1,200th chapter. When we reach that milestone, we'll award a prize to both the 1,200th chapter and one of the other 1,199 chapters as a way to celebrate the occasion. "'Cause I'm Pooped!" -- San Angelo, Tex. "'Cause He's a Wakefield" -- Jonesboro, La. Count Istvan Teleky Exists!" -- St. Mary's W.V. Bradford Taylor's Mink and Rabbit Ranch -- Moose Lake, Minn.
Likely to Become Charming -- Flynn, Tex. Silver Star Badge Society -- Owensboro, Ky.
"Weary Totin' Such a Load" -- Jacksonville, Fla.
Briscoe's Jug -- Colonia, N.J.
Spot, the Talkin' Dog -- Clinton, Tenn.
Folks in Fort Worth, Tex., are also trying to come up with a name for a new chapter in their area. If you are interested in starting a chapter of TAGSRWC, all you have to do is pick a name that has not already been chosen (check online for a list of chapter names that are already taken) and submit a list of your founding members by postal mail to TAGSRWC's HQ at 9 Music Square South, PMB 146, Nashville TN 37203-3286. We'll verify your chapter name choice and send you an official Chapter Charter. Or if you would like to join or contact an existing TAGSRWC chapter in your area, write to TAGSRWC' s HQ and we'll help get you in touch. In a large bowl combine the Cool Whip, lemonade, and sweetened condensed milk, blending well. Pour the mixture into the crust and chill until firm, about 2 hours. Serves 6-8. The prize for the person turning in the quiz with the most correct answers is once again the winner's choice of any one item in the April 2001 Bullet that has not sold out by the time the contest ends or any one item available at our Weaver's Dept. Store site online (excluding the Collectibles area). In case of a tie, we'll draw a name from a hat. Name two instances (separate episodes) that South America is mentioned in Mayberry. Identify the one time that the Maharajah of Singapore is mentioned in Mayberry. Who in Mayberry once sort of ponders selling Encyclopedia Europa? Name two instances in which reference is made in Mayberry to either "gluttons" or "gluttony." Name a time when "The Wreck of the Old 97" is mentioned in Mayberry? What criminal mentioned in Mayberry was once wanted for grand larceny with a $4,000 reward offered? E-mail your answers to ebullet@tagsrwc.com or mail them to TAGSRWC, 9 Music Square South, PMB 146, Nashville TN 37203-3286. Again, the deadline for entries to be e-mailed or postmarked is July 5, 2001. Good luck! You can find Mr. Weaver's full lineup of favorite Mayberry items at http://iMayberry.com/tagsrwc/weavers/ but here are our four newest items, which are also among the best-selling items this summer. This brand new shirt is so simple that it's just plain Mayberry. Shirts with character faces are, of course, terrific but sometimes you want a T-shirt that's more understated and maybe not so, well, in your face. It has blue and yellow lettering that says "Mayberry, North Carolina" and "1960" on a white shirt. Available in M, L, XL and 2XL. this just may be one of the coolest items we've ever carried. This sculpted ceramic cookie jar features Andy and Barney hanging out the windows of the squad car (but not like a dog!). The hand-numbered edition is limited to just 2,400 pieces. It measures roughly 12 x 6 x 6 inches. Hot off the press this year is a wonderful book inspired by the popular Mayberry Bible Study that has been sweeping the country. The attractive 182-page paperback is peppered with well-chosen photos. But what makes this book's 30 chapters (each focusing on a favorite Mayberry episode) so special is the deeply personal and meaningful way that Joey Fann uses humor, sincerity, and sound reason to draw together lessons from Biblical Scripture, events in Mayberry, and elements and actions in his own life. This is a very satisfying book to read in that it combines familiar touches of Mayberry with one man's thoughtful examination of his faith and search for meaning in his own life. Priceless reading for only $11.00. This over-sized book was 40 years in the making. It contains more than 350 absolutely eye-popping color and black-and-white photos, most never before published or not published more than maybe once in 40 years. The vast majority of shots are candid, behind-the-scenes photographs. Virtually all of the posed shots that are included are ones that are considered especially good or rare. This 250-page hardcover book measures approx. 9 in. x 11 in. and has a suggested retail price of $35.00, but it's on sale at Weaver's for just $32.00 and is ready for immediate delivery as a handsome keepsake to be enjoyed by anyone who loves Mayberry. Two special corners of Weaver's Department Store online are the Collectibles and Art Gallery sections. You'll find lots of out-of-production and hard to-find items-including TAGS calendars from 1992 and 2000, Rod Sadler's portrait sketches autographed by TAGS stars, and rare (though non-Mayberry) scripts that were used by Hal Smith (Otis). And don't forget that TAGSRWC and Weaver's now have Gift Certificates that may be ordered online or by mail. 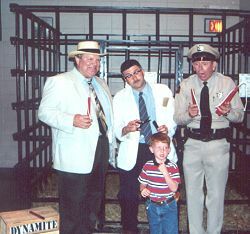 Cullman, Ala. has "Jimmy the goat" and the gang come "Home to Mayberry"
The largest gathering of fans since the April issue of the printed Bullet was the "Welcome Home to Mayberry 2001" event hosted by TAGSRWC's Esquire Club chapter in Cullman, Ala., in May. About 500 fans turned for the evening of Mayberry entertainment. Another big gathering with a Mayberry flavor was the annual Mule Days in Gordo, Ala. Our own Allan, "Floyd" Newsome, David "Mayberry Deputy" Browning and Kenneth "Otis" Junkin were on hand, as they were also at the earlier Cullman event. "Some of Us Got It, Some of Us Ain't" chapter as The Darling's (from left to right) are... Wayne Barbour , Joe Pritchett , Robbie Pollock, Jeff Wilsonand David Barefoot. 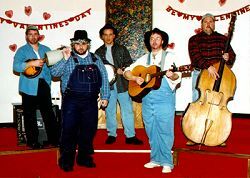 Speaking of David Browning, he has just recorded a live album with the popular VW Boys (including members of "Got Time to Breathe, Got Time for Music" chapter in Blountville, Tenn.). The album will be released later this summer. By the way, VW Boys member Larry McPeak's many Mayberry fans and friends are glad to know that he received his long-awaited liver transplant earlier this year and is doing very well. Other chapters in action the last couple of months include "Some of Us Got It, Some Us Ain't" (Garner/Clayton, N.C.). They had a music-filled meeting back in February that included their version of the Darlings. Mayberry chapter (Knoxville, Tenn.) were well represented with several members and Doug Claxton's 1964 Mayberry Squad Car replica in April's Dogwood Arts Festival Parade. The group also expects to be out in force for the upcoming cast events in nearby Pigeon Forge and at Opryland. Barney chapter (Greensboro, N.C.) has continued its regular meetings, including one June 16 that had the theme of Opie's birthday party, for which everyone was asked to bring "childish" items as a gift that could be given to a local charity. On June 14, Barney chapter member Neal Brower (known in Mayberry for his Professor Brower columns in The Bullet and for his excellent book, "Mayberry 101") delivered one of his always-outstanding lectures on TAGS as the kick-off of the exhibit on Andy Griffith at the Wilson Library at the University of North Carolina at Chapel Hill. The exhibit is free and will be open through August 22. 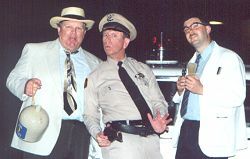 Otis, Barney and Floyd on duty at Cullman and Gordo. "Watch Out Big Ears! There's a Crazy Owl Flying Around" chapter leader Greg Barkley has been teaching a successful "Mayberry Bible Study" in the chapter's home base of Denver, N.C. Jack Ginn of "Pipe Down, Otis!" chapter (Decatur, Ga.) is among the other TAGSRWC chapter representatives who've recently been teaching a Mayberry Bible Study. Greg Carson of "She's Nice!" chapter (Hendersonville, Tenn.) is teaching the second installment of his periodic class on Mayberry at Father Ryan High School in Nashville on June 25. "Mayberry Says Thanks and Happy Motoring" (Phoenix, Ariz.) held its 168th chapter meeting this month. And finally, "Who's Been Messin' Up the Bulletin Board?" chapter continues to thrive online with over 1,700 subscribers/members. (Like The eBullet, a subscription to the virtually daily Digest of "WBMUTBB?" chapter is free.) The online chapter is heading up a fund-raising silent auction for the Surry Arts Council during Mayberry Days. For information, about how your can participate in the auction, send an email to ebullet@tagsrwc.com. Don Knotts recently returned from a couple of tour dates with Tim Conway in the Pacific Northwest and is now preparing for his two stops during a weeklong visit to Tennessee beginning June 25 at Pigeon Forge. Ron Howard is well into production on his next film, "A Beautiful Mind," which may be released as early as this Christmas. George Lindsey recently appeared on the Grand Ole Opry and participated in a 4-state media tour in support of the upcoming Mayberry Cast Reunion at Opryland. And George was the Commencement speaker for Speake High School in Speake, Ala. Among the graduates was George's fellow actor and friend, Lucas Black ("Swing Blade"). As this eBullet was preparing to fire, Howard Morris, who is on his way to Tennessee, was planning to swing up to New York to see good friend Mel Brooks' "The Producers," which of course is currently the red-hot ticket on Broadway. Rodney Dillard's Mayberry Values radio show is now syndicated to about 20 radio stations nationwide. He's been busy in the recording studio, too. His latest album as the Dillard/Haynes Band is "There Goes the Neighborhood." When you see the summer series "Spy TV" on NBC during the next few weeks, you'll know there's a Mayberry connection in that Maggie Peterson "Charlene Darling" Mancuso was the location manager for many of the sites used in the show, which was filmed largely in Las Vegas. Richard O. Linke, TAGS associate producer and longtime manager of Andy Griffith, Jim Nabors, Ken Berry, Maggie Peterson, Ronnie Schell and others with TAGS connections, says that he is doing well and really enjoying his retirement in Hawaii. Just lots of sun and relaxation. He doubts that he and wife Bettina will make it over to the "mainland" this year after spending about a month over here last fall. But he sends his best ("Aloha") to all his friends in Mt. Airy and elsewhere on the Mayberry trail. 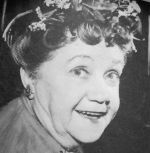 Barbara Perry (Floss and other Mayberry townspeople) says that she is getting around well (and even dancing again!) after her hip surgery last December. She greatly appreciates the encouragement she has received from Mayberry fans. Director Earl Bellamy also says that he's doing well. He appears at occasional festivals, but mostly is just enjoying his retirement and traveling from time to time (most recently to Spain and Portugal). We are sorry to report the passing of two actors with Mayberry ties. Sally Mansfield, who appeared in two episodes of TAGS (Episode 6: "Andy on Trial" as secretary Miss Fenwick and Episode 172 "The Cannon" as thief Stella) died on January 28 in Westlake Village, Calif. She was 77. Besides her TAGS work, she starred as Vena Ray in the 1950s TV show "Rocky Jones, Space Ranger" and played Connie in "Bachelor Father." She also appeared in numerous sci-fi films and roles. She had a small part in the Jerry Lewis film "Errand Boy." Sir Lancelot, another actor with a small but distinctive Mayberry role, passed away on March 12 in Anaheim, Calif., at the age of 97. Sir Lancelot, whose full name was Lancelot Victor Pinard, played the man who rented the cottage to Howard Sprague in Episode 235: "Howard's New Life." Sir Lancelot was born in Cumoto, Trinidad, in 1903 and became noted for his performance of Calypso music in several movies in the 1940s and '50s, including "The Curse of the Cat People" and several zombie movies that were popular during that era. His most notable film likely is "To Have and Have Not" with Humphrey Bogart and Lauren Bacall. Sir Lancelot continued acting and performing music until a few years after his appearance in Mayberry. He then enjoyed three decades of retirement. That's all of the news for this first issue of The eBullet. Again, we encourage feedback from readers at ebullet@tagsrwc.com to help us "Taylor" future issues to what most readers would like to see in their eBullet issues. We also plan to bring our question-and-answer/comment forum, "Emmett's Fix-It Shop Talk," online in future issues. And another popular feature of the printed Bullet, Professor Brower's Class (a column by Neal Brower), will also debut online in an eBullet issue later this year. Look for your next eBullet in mid-August and be sure to check the eBullet archives at http://tagsrwc.com/ to see the little extras (such as photos) that we can't send by email.